This small but useful utility will help you to detect a native screen ratio (NSR) of your monitor and also to set a new graphic mode. Your monitor’s native screen ratio refers to the ratio between its width and height. For example, a 4:3 display produces an image that is more square, where a 16:9 ratio produces an image that is more rectangular in shape. For example, the 16:9 NSR is sometimes referred to as 1.78:1, or simply 1.78. It is because 16 divided by 9 = 1.78 which is the same thing. A 1.78 screen is 1.78 units in width for every unit of height. The computer display industry has been moving away from the 4:3 format in recent years, but 4:3 NSR displays are still in use. If you have an LCD monitor, check your screen resolution. This helps to determine the clarity of on-screen images. It’s a good practice to set an LCD monitor to its native resolution. To see your monitor’s native resolution, check the last row in the “Available Modes from the main adapter” list in Detect NSR Utility. It is always the maximum resolution which your monitor can display. Detect NSR Utility is also a part of GBCAT – Computer Aided Transceiver, where it has the function to detect a graphic adapter, to calculate NSR and to set the appropriate ratio between some graphic elements, like an appropriate display of the analog S-meter unit simulation. Thanks to my friend Wim PA3WT, this utility is also tested on sometimes capricious ATI Mobility Radeon HD 5470 graphic adapter and works as expected. Software requirement: Installed Microsoft(tm) .Net Framework 4 Client Profile. 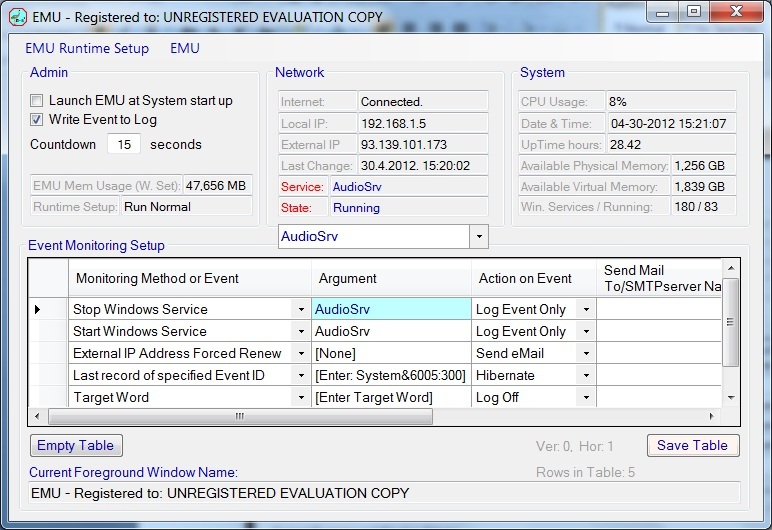 Tek stualno-slikovni prikaz mogućnosti EMU – Event Monitoring Utility. Download je moguć svim posjetiteljima, bez registracije, klikom na riječ “Download“. EMU help file is also available on English language, here.